Despite the fact that some leading countries and international organizations put pressure on the conflicting sides in some cases, double standards are applied to the Armenia-Azerbaijan Nagorno-Karabakh conflict, Azerbaijani Defense Minister, Colonel General Zakir Hasanov says. 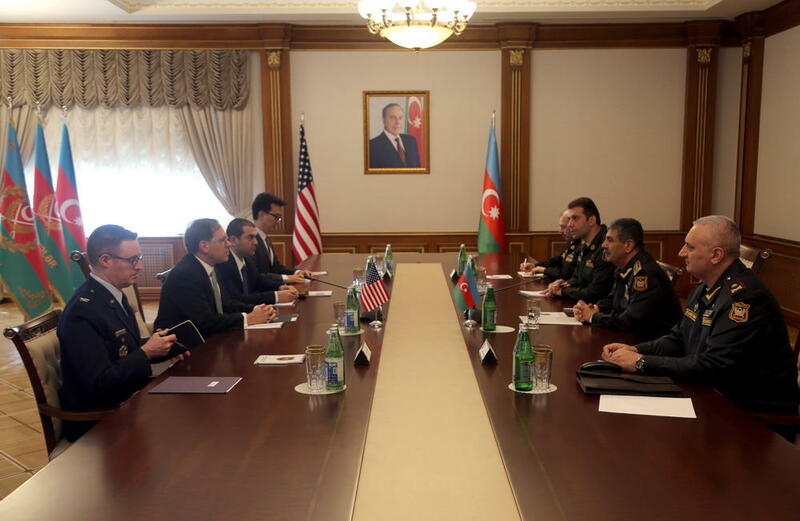 Hasanov made the comments during the meeting with newly appointed US Extraordinary and Plenipotentiary Ambassador to Azerbaijan Earle Litzenberger in Baku, Trend reports referring to the Azerbaijani Defense Ministry. Having congratulated the ambassador on the new appointment, the defense minister expressed confidence in the further expansion of Azerbaijan-US relations during the period of his diplomatic activity in Azerbaijan. Stressing that relations between Azerbaijan and the US are built within the NATO programs and on a bilateral basis, the defense minister brought the Ambassador’s attention to the importance of developing cooperation in the military, military-technical and military-educational fields. Touching upon the military-political situation in the region and stressing the continuation of Armenia’s aggression policy, Hasanov noted that despite the efforts of the OSCE Minsk Group’s co-chairs in the settlement the Nagorno-Karabakh conflict, peaceful negotiations are deliberately delayed by Yerevan. While expressing gratification with the appointment as the US Ambassador to Azerbaijan, Litzenberger said that during his activity he would make every effort to develop relations between the two countries. Stressing that the US recognizes Azerbaijan’s territorial integrity and treats it with respect, the US diplomat noted that his country supports a peaceful solution of the Nagorno-Karabakh conflict, adding that this is also important in terms of the development and security of the South Caucasus. Noting the strategic importance of cooperation between the US and Azerbaijan, the Ambassador emphasized that he was following the reforms implemented in Azerbaijan Army and appreciated the success achieved in this area. Then the parties discussed issues related to regional and bilateral cooperation, the security of the Caspian Sea and important strategic infrastructures, the fight against the proliferation of weapons of mass destruction, the organization of mutual visits of specialists in military education and a number of other issues of mutual interest. Touching upon military cooperation between the two countries, Litzenberger expressed his satisfaction with the participation of Azerbaijani peacekeepers in the mission carried out in Afghanistan.